Millions of immigrant families in the U.S. are awaiting the Supreme Court’s June decision on whether to uphold President Obama’s 2014 executive action on immigration. In California, a total of 1.25 million immigrant adults and children would be eligible to apply for temporary relief from deportation and work authorization, according to estimates from Pew Research Center. This includes immigrants newly eligible for the Deferred Action for Parents of U.S Citizens and Legal Permanent Residents (DAPA) program and the expanded Deferred Action for Childhood Arrivals (DACA) program, in addition to adults and children eligible under the original DACA program created in 2012. In California, the Supreme Court’s decision would not only clear the way for improved work opportunities and wages, reductions in child poverty, and greater peace of mind for families, but it also would expand access to comprehensive health insurance for many. While undocumented immigrants, including those with DACA or DAPA, are excluded from Medicaid and other health coverage options under the Affordable Care Act, low-income immigrants with DACA or DAPA are eligible for Medi-Cal (California’s Medicaid program) under state policy. 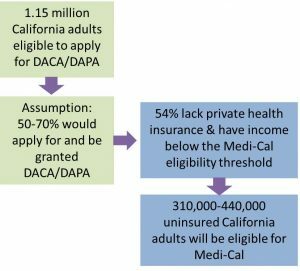 We estimate that between 310,000 and 440,000 California uninsured adults with DACA or DAPA will be eligible for Medi-Cal after the federal programs have been implemented for several years, based on an analysis conducted jointly by the UC Berkeley Labor Center and the UCLA Center for Health Policy Research in 2015. Of the 1.25 million Californians eligible for DACA or DAPA, 1.15 million are adults (undocumented children are already eligible for Medi-Cal). Sign-up rates for DACA and DAPA are highly uncertain, but for purposes of this estimate we assumed that between 50% and 70% of Californians eligible for the federal programs will apply and be approved. Not all will sign up because of inability to afford the $465 application fee, not having all of the required paperwork, uncertainty about how to apply, needing application assistance, or fears and legal concerns about applying. The majority (54%) of California adults eligible for DACA or DAPA lacked private health insurance and had income below the Medi-Cal eligibility threshold (139% of the federal poverty level, or $33,800 for a family of four in 2016), according to the UCLA-UC Berkeley analysis of data from the 2013 Current Population Survey. This is a high-end estimate because income and access to job-based coverage could increase for individuals with DACA and DAPA as a result of the expanded work opportunities. Additionally, this income data was collected prior to California’s recently implemented and scheduled increases in the state minimum wage. Not all Californians with DACA or DAPA who are eligible for Medi-Cal would enroll in coverage. The limited available data suggests that Medi-Cal enrollment for the 200,000 Californians granted DACA under Obama’s 2012 executive action has been low, at least as of mid-2014. Barriers have included confusion about the Medi-Cal eligibility policy for this group among both enrollment workers and applicants, and immigrants’ fears and hesitations about applying for the state health insurance program. 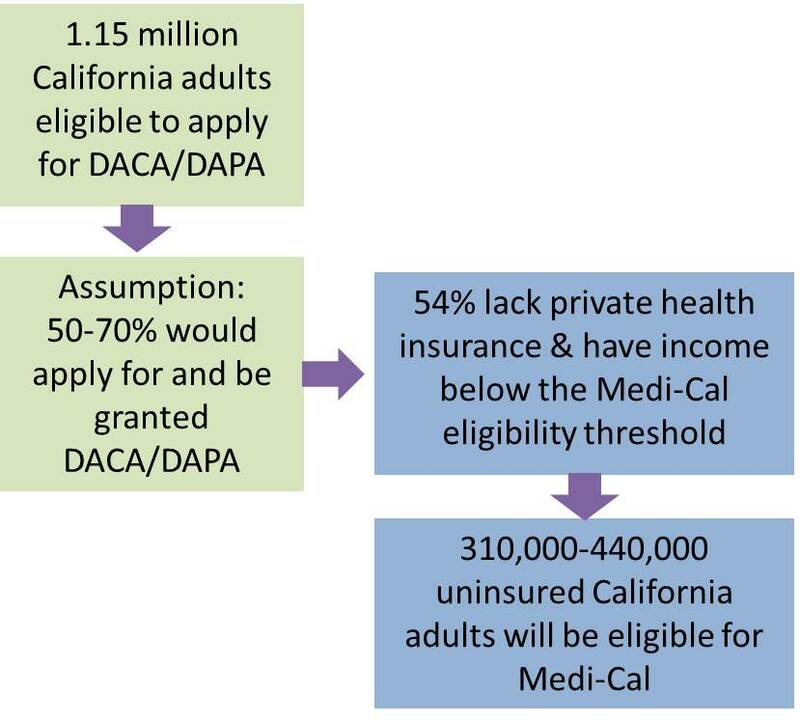 A Supreme Court decision upholding the President’s executive action combined with California’s inclusive Medi-Cal eligibility policy for immigrants with DACA or DAPA have the potential to significantly reduce California’s uninsured population, which is projected to include up to 1.5 million undocumented and uninsured individuals in 2019. However, undocumented immigrants are still likely to make up the largest group of Californians remaining uninsured even several years after implementation of this executive action. Not all undocumented immigrants will be eligible for or be approved for DACA or DAPA, some will have income that makes them ineligible for Medi-Cal, and others will become eligible for Medi-Cal but not enroll. To maximize health coverage among those with DACA and DAPA in California, it will be important to improve awareness of this Medi-Cal eligibility policy and provide assistance to Californians in signing up for DACA and DAPA and in enrolling in Medi-Cal.